Our global network will save you money. Request your cost analysis now. Our Education Services customers save an average of $80,000 annually in freight alone. Do you offer classes internationally in Asia, Europe, the Middle East, Australia, and South America? If yes, OnFulfillment's global infrastructure will deliver significant cost savings. 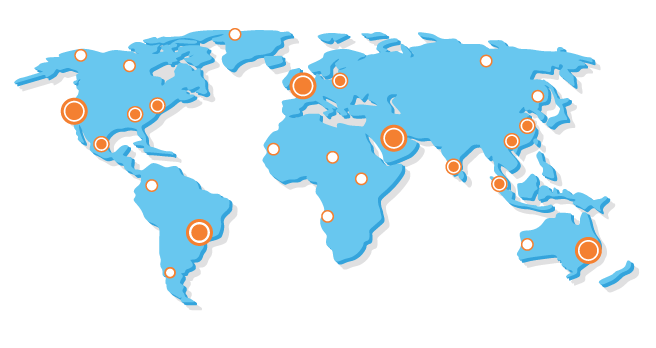 OnFulfillment has print and warehouse facilities in 13 locations around the globe, with multiple locations on all continents. Our extensive network ensures that we can print and ship your courseware locally, to support all of your global classes. You'll avoid international shipping charges and customs, saving significant money and avoiding the hassle of your courseware being stuck in customs. If your current print provider is printing and shipping from only North America, or from only a few global locations, we guarantee we can deliver significant cost savings with our global infrastructure. Just complete the form, and we'll run the numbers for you.